Once I visited Purvotar in NE India near the Nepal boarder to deliver a 10-day yoga programs in two prisons. I witnessed in the Himalayas many automatic machines cutting down enormous, ancient trees in just a few minutes. It reminded me of the Khejarli Massaacre of 1731 when Amrita Devi, a Bishnoi woman who, along with more than 363 other Bishnois, died for the protection of Khejari trees near Jodhpur, about an hour south of our ashram in the Marwar region of Rajasthan. 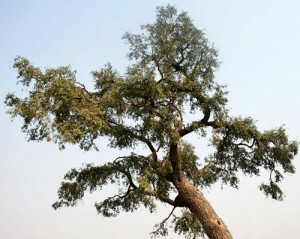 The founder of the Bishnoi faith, Jambhoji, taught his disciples “Seer senthe runkh bache, to bhi sasta jan” which means “your head is cheaper in exchange for a tree.” Jambhoji understood the delicate ecosystem of the desert in which his people lived, and discovered that cutting without understanding of the consequences makes an imbalance, not only in the environment, but also in the persons doing the cutting. He was able to make this connection because his sensitivities were very deep from his spiritual practice. With consistent practice you too can see the life in the trees, the different energy of water, and its effect on earth and fire. It is no coincidence that most of the spiritual places in the Hindu religions are in natural places – mountains, rivers, the sea. This was purposeful in encouraging people to make pilgrimages, and witness the setting. Think about the last time you walked in nature to a destination. The walking clears your busy mind away from the heart’s path. And when you arrived, you were better able to see your destiny – the details, symbols, and lessons that it offered you in the moment. When we talk about environment it is compulsory to talk also of spirituality. It is two sides of the same coin. When I travelled the first time to Mt. Abu, in the majesty of the greenery and waterfalls I experienced the faith that is Bhagwan (God) in this place. I have had an interest in nature’s spirituality from my childhood – it was part of my family and my culture. I was taught to love flowers, bushes, trees, butterflies, birds, animals, mountains, sand dunes, everything in the sky, and humans as well. We can rely on the symbols nature provides to help resolve the suffering caused by ignorance. All nature fills me with wonder, and from it comes my continuing education about my place and purpose in this world. Even though our interdependence with nature is obvious, the presumed need to rapid development obscures common sense. In some countries the real work is being done, but in others just formalities. Germany culls forests with purpose within a ratio that encourages the forest to grow and thrive. Yet, in Ghana, Nigeria big companies clear cut and sell the wood to other countries, undervalued, and in most cases as payments for international loans undersigned by politicians. 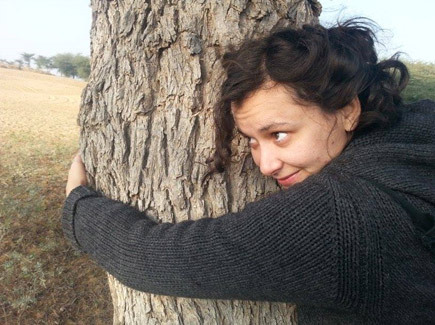 Here in India there are strict rules to protect the environment, specific policies to protect in particular the trees. Yet the government’s will power is weak in following these rules. Perhaps with our new prime minister, things will change and we can unite in loving nature, and thrive in nature’s love for us. After getting the initiation from his Guru Gorakhnath, our founder Shri Jasnathji’s first act was to stab his walking staff into the soil, thus planting a Jal tree. There, in what is now Katresar, he sat and started meditating and teaching people, spreading the knowledge of truth, connecting man to nature through sound. That tree is standing still today with development happening all around it. So go for a walk today, breath with the trees – listen to their song about our destiny.